Started in 2000, every year Nittai Dai students from the martial arts department will travel around the world to spread and increase awareness of the Japanaese traditional martial arts and cultural arts. They have been to Australia, Germany, and Hawaii. For the first time they will be coming to Singapore for this exchange of traditional culture. Don't miss this opportunity to learn and widen your knowledge! 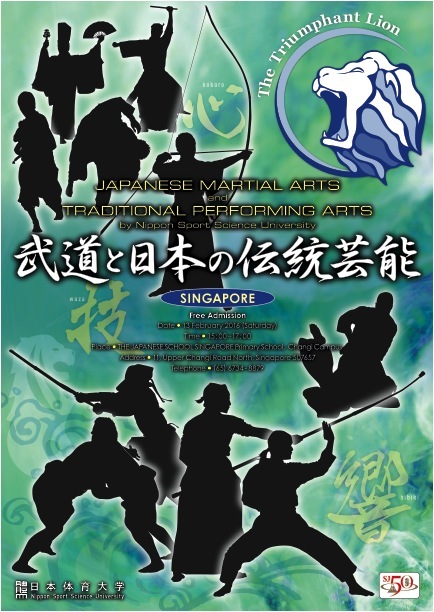 The demonstration will feature Kendo, Judo, Sumo, Kyudo, Naginata, Aikido, Karate, Shorinji Kempo, Traditional Japanese Dance and Taiko Drumming. Public are advised to take the public transport, as the carpark is only available to officials only. There will be 40 students from Nittai Dai Kendo department, and the seminar will be led by Yagisawa sensei (hachidan). Seminar fee will be announced at a later date. Pre-registration is required before Feb 7, Sun, to ensure you have catered food. You may register with Ms. Ching Hui. Kindly make payment to Ms. Cheryl on Feb 7 training, training venue - SUTD.